Mr. Donald Alexander Adair was born July 1, 1931 at Kessler, Alberta, the fourth and youngest child of John Erwin and Edith Adair. He grew up on the ranch 4 miles west of Kessler and with his mother who taught school in the Red Willow district. It was there he met Violet Anderson of Donalda, Alberta and on July 1, 1951 they were married. Their family was made complete with the arrival of Gloria in 1952, Bruce in 1954 and Glen in 1957. 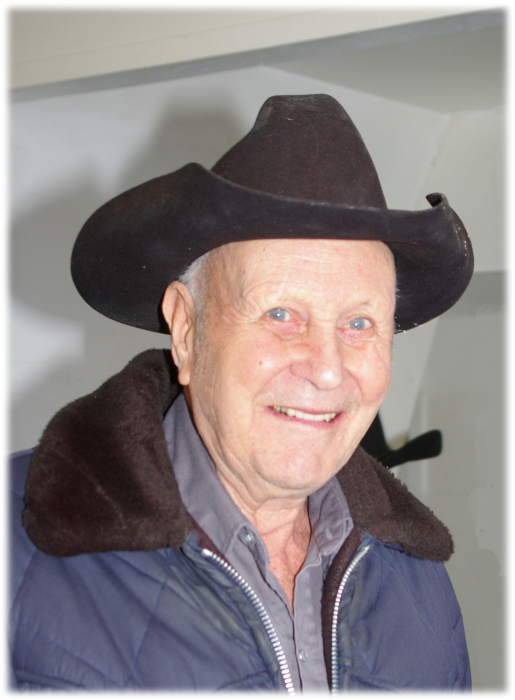 Don worked for various farmers and threshers in Czar, Throne, Red Willow and Stettler districts before purchasing his own farm in 1961 west of Brownfield. Don and Violet attended Fairfield Baptist Church and it was there that Don professed his faith and was baptized in 1967. Together they had bible studies in their home both in Brownfield and later in Castor. Don milked cows and hauled cream to Castor Creamery until his herd increased to 45 milk cows and at that time he put in a bulk tank system and sold milk to Alpha in Red Deer. In 1979 Don sold his dairy cows and equipment and began driving school bus for the West Brownfield route for the next 15 years. Don always had horses around including saddle horses and a team for doing chores. In 2005, Don and Violet retired from the farm and bought a home in Castor. He continued to enjoy card and crib games with guests and neighbours, gardening, bible studies in their home and especially Thursdays working at the Opportunity Shop. He also sewed over 200 quilted sleeping bags for the homeless on his heavy sewing machine which were then delivered to The Mustard Seed in Edmonton. Don and Violet moved to Paintearth Lodge in December 2017 when their health required more care. He enjoyed teasing staff and visiting with residents. Don passed away peacefully on November 22, 2018 with family at his bedside still teasing nurses and staff. Don is survived by his loving wife Violet of 67 years; children: Gloria (Wayne) Bahler, Bruce (Jean) and Glen (Kathy), eight grandchildren: Troy, Trina (Glen), Trisha, Ken (Treena), Tammy (Chuck), Shiana (Rob), B (Alix), Brittany and fourteen great grandchildren: Kimberly, Whitney, Kiyoshi, Kaley, Austin, Alexis, Heidi, Kaleb, Breanna, Annika, Ella, Tegan and Aliza.